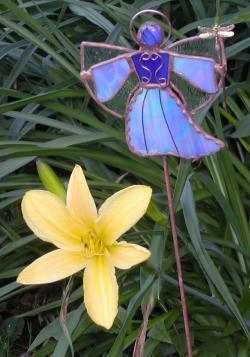 These glass angels shimmer as they look over your garden. Their dresses are made from a variety of glass colors - several are pictured here. 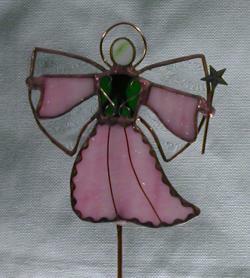 The wings are clear patterned glass. Each is holding a sceptor with a trinket on top. 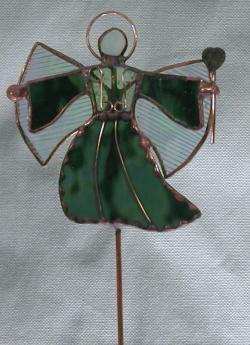 The angel stands about 6 inches high and is mounted on a copper rod - standing about 32 inches high. 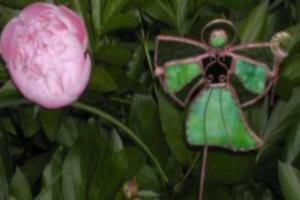 The angel pictured in the right lower panel is made form the bottom of a wine bottle and twisted copper wire. 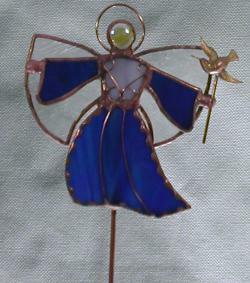 A glass heart is mounted in the center. 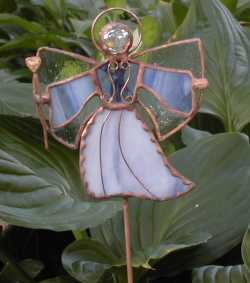 The entire angel is mounted on an outdoor brass faucet that has glass beads coming from the faucet. 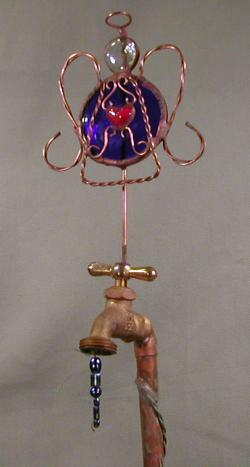 The entire assembly is mounted on a wire-wrapped copper pipe that is 30 inches high. The color of the bottle is avaible in green, blue, clear, or frosted clear. The glass beads can also be coordinated as you desire.